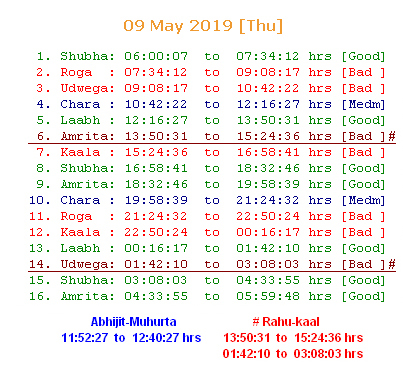 Muhurta is essentially a measure of time which refers to the application of Vedic astrology wisdom in determining the auspicious time for starting an event. The following report tries to identify the "Best Possible Date" and "Time" within a given duration (of about 90 days) for wearing the suggested astral gem. To obtain the full benefic effects of the astral gem, it's ring should be made and worn while Moon is waxing ('Shukla-paksha') on the specified "Vaar" (Day of Week) & time (auspicious Chaughadia). Wearing it in one of the three Nakshatras of concerned planet will enhance the benefic effects of the gem. You should select a good ‘Chaughadiya’ for precise time of gem wearing on selected day. The ‘Amrit’, ‘Shubh’ and ‘Laabh’ are Good (favourable) Chaughadiyas. Choose any one of them. 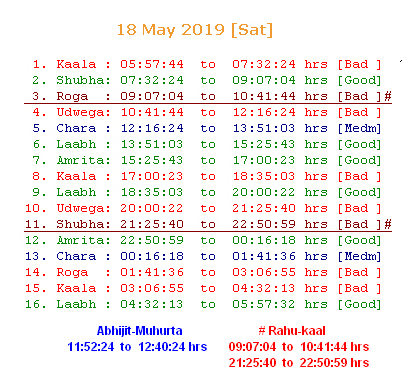 However, avoid 'Rahu-kaal' even if it is otherwise a good Chaughadia. 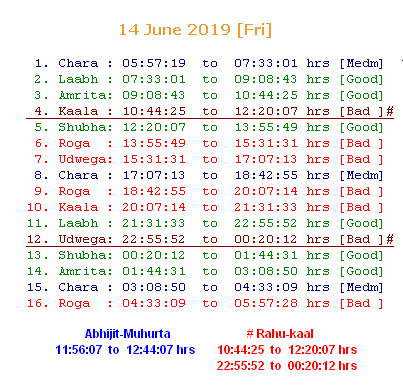 All shown timings in following Nakshatra scanning table are "Indian Standard Time", i.e., 5:30 hrs ahead of GMT. For all other countries, time should be adjusted accordingly. There are following three conditions, if fulfilled simultaneously on any date, that would be considered the best Muhurta to wear suggested gemstone. But it is not necessary that you will be able to find such dates easily in coming few months when all these three conditions are being met simultaneously. Therefore, normally, when any of these two conditions are met, it is considered moderately good Muhurta and you may wear concerned gem. 1. It should be one of the three required Nakshatras on that date. 2. It should be the required "Vaar" (Week day) . You may wear your gem stone on any of the above mentioned dates, which have been found qualifying as "Excellent" or "Moderately Good" Muhurtas. BUT Gem wearing time should be within the duration of concerned Nakshatra. 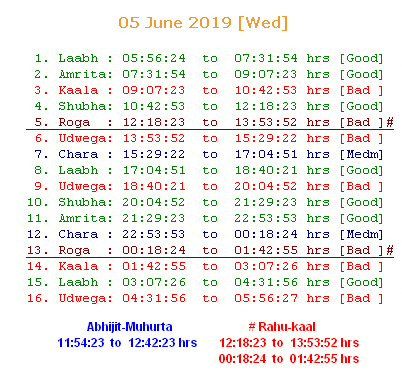 The Nakshatra's Start and End timings have been clearly mentioned in the table against each date. 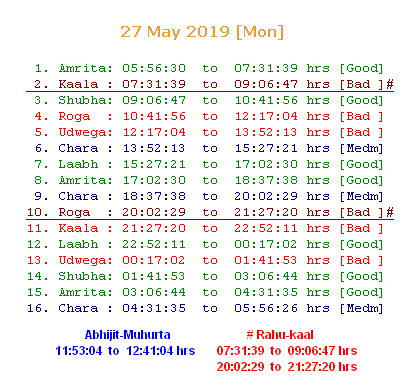 To further refine the quality of Gem wearing Muhurta, you should choose an intra-day time, on one of the above mentioned dates, when an auspicious "Chaughadia Muhurta" is also present. However, the chosen Chaughadia should be within the duration of concerned Nakshatra. Even an auspicious Chaughadia Muhurta should be rejected if it falls outside the Nakshatra duration. The "Shubh", "Laabh" and "Amrita" Chaughadias are normally considered auspicious. 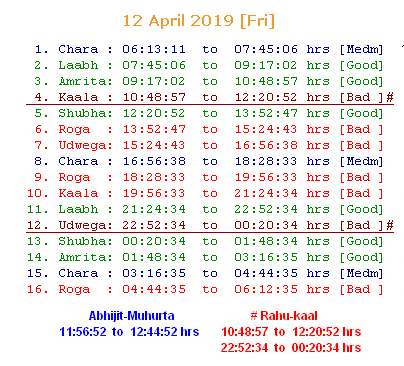 However, if "Rahu-kaal" is over-lapping the above mentioned auspicious Chaughadias, then, in that case, that particular Chaughadia should be considered inauspicious and should be avoided. 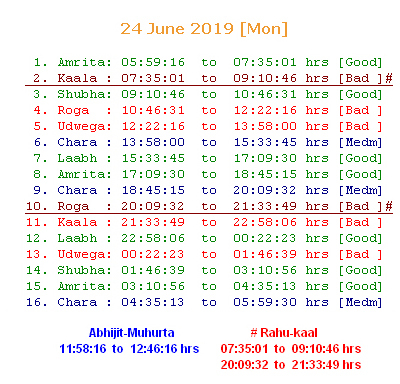 In the following tables, Rahu-kaal has been denoted by "#". 1. 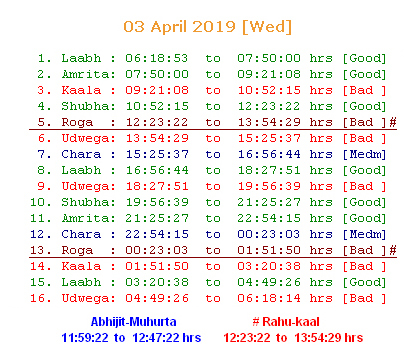 Avoid "Rahu-kaal" timings, shown with the "#" mark, even if, otherwise, it is a good Chaughadiya. In such a case, this report has also marked the concerned timings as "[Bad]", even if it is "Amrita" or "Shubha" Chaughadiya. 2. In some regions of the globe, watches are moved ahead by one hour during summer months. It is called 'Day-Light Saving Time' (DST). If DST is applicable at your current location during the considered duration, we will prepare the following Chaughadia tables accodingly. You need not to adjust DST. 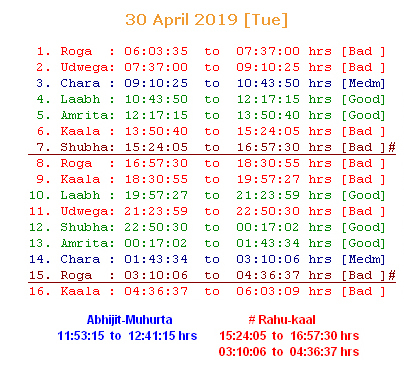 All timings in the table below would be usual "Zonal Standard Time" of the concerned country/state, shown by adjusted watches at that place. Note: The above shown multi-coloured Chaughadia tables are for demonstration purposes only for this sample report. In actual customer reports, these tables will be present in "Black & White" mode only, but will contain same information. I do hope, above analysis helps you in wearing your lucky gem stone at an auspicious time. The gem stone worn in appropriate Shubh Muhurta will energize you physically, mentally, and spiritually. You will feel inner peace and happiness after wearing the recommended gem stone. Get ready to harness the power of the planets to get your luck working for you.